Antique Radio Forums • View topic - Pics-TV Transformer 75/300 ohm which is better, how to test? Pics-TV Transformer 75/300 ohm which is better, how to test? Although your test method is faulty, as the rabbit's ears are not 300ohms thereby mis-matching the balun, I think that at last you have answered your own question. impedance ratio for 50 to 200 ohms as well as it works for 75 to 300 ohms. mis-matching the balun, I think that at last you have answered your own question. Negative Maverick you are not clear for a flyby? Please show me your reference and explain, showing me your calculations. So what is the impedance? (I give geometry and Freqs below). True a folded Dipole is 300 ohms and this is not folded. The formula is 75 + j300 Ω.
relative test between to similar baluns on the same antenna? know how to calculated it. I am sure there is a little software to spit out a number. but more than 75 ohms. is that not good info. (unless it has a balun built in and 75 ohm coaxial, like many do now). ears and my DIY 4 bay bow tie, basically 4 dipoles in-phase). ground, Freqs: 199 Mhz, 489 Mhz through 681 Mhz. difference does it make when checking two baluns? I think at last you have answered your own question. 1) Just leave what I have. 2) Buy a preamp that has 300 ohm input. 3) Buy a Channel Master CM94444 balun which claims to be low loss? 4) Buy a mini circuit or coilcraft communication RF transformer to experiment with. 5) DIY, fair-rite binocular nickel ferrite core, bifilar wound, 1:4, current Guanella balun. Last edited by gmcjetpilot on Aug Tue 16, 2011 1:39 am, edited 1 time in total. Where have you been PETER! Yes that is the info. I never thought of that. This will come in handy if I decide to make my own.... which I think would be a fun project. Of course I don't have a all that gear, at least anything that can get any where near as high as 700 Mhz except for the trusty HP8640B..... This will take some reading and research to experiment with.... which is fun to learn. The companies that make RF transformers for the communication industry have a bunch of designs, with all the engineering data that certainly must be better than what ever they shove in those plastic tubes from China, they call TV matching transformers. This one is perfect with under -1.5dB for the whole TV band from High VHF to channel 51 (~700 Mhz). The only problem is buying one as an individual. The other option is wind my own. The only question is what core material. If you get a chance Peter take a look at this link below, let me know what you think last page, type 67 material looks best. Once I have a core get some magnet wire and try some winding. I can always redo it. I might call them Monday and see if they will give me a suggestion for material to use. I suspect that the TV transformers off the shelf use some basic ferrite material, nothing to exotic like magnesium or nickel ferrite mixes. Last edited by gmcjetpilot on Aug Tue 16, 2011 2:26 am, edited 1 time in total. 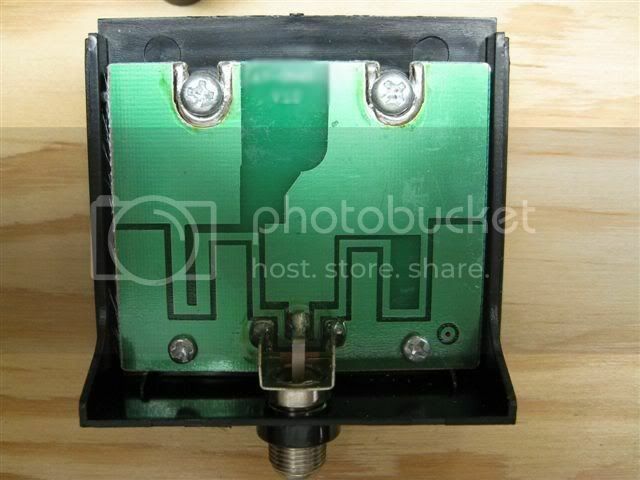 What to do for the Best 300/75 Ohm UHF TV balun? I agree with gmcjetpilot the best/most practical thing to do is to select a MCL transformer. I have been able to get small quantities from them but I never tried quantity 1. Other than that, if you really want to roll your own I suggest you build a transmission line transformer/balun using the methods and design procedures published by Jerry Sevick and others. Be advised there is a huge amount of misleading and flat out wrong information on the topic(s) of balun, broadband transformers and transmission line transformers. You can indeed do broadband impedance conversion and balance to unbalanced line conversion with conventional transformers. Conventional in this case means two ( or more) windings on a common core, with magnetic flux generated by on winding being transformed into a voltage in the other winding. The primary to secondary voltage ratio is proportional to the winding ratio and the impedance ratio is proportional to the winding ratio squares. In other words a conventional transformer. Conventional flux coupled transformer performance starts to fall apart in the UHF region due to stray capacitance, transformer leakage inductance, transformer lead inductance and loss of magnetic material mu. I built a ferrite loaded transmission line transformer using information from Sevick that matched a 300 Ohm load to 50 Ohms, and which worked well from 20 to over 1000 MHz. To be honest with you I don't think it is worth the effort for your application. I suggest a MCL transformer instead. But if you want to know more about transmission line transformer please contact me. Be advised the amateur literature- one prolific author in particular- has many references to broadband RF transformers with the primary and secondary ( and sometimes triniary and quadanary) wires twisted together to allow for tighter coupling. and then wound as a conventional flux coupled transformer. The literature mistakenly refers to these as "transmission line transformers. Servick style transmission line transformers might well be made with transmission lines consisted of individual wires twisted together but do not rely on magnetic flux coupling. Gmcjetpilot gave you good advice. To do better I would advise a transmission line transformer as described by Serivk but I am not sure you will actually see any improvement without rather good RF test equipment to make actual insertion loss and impedance measurements. I agree with gmcjetpilot the best/most practical thing to do is to select a MCL transformer. I have been able to get small quantities from them but I never tried quantity 1.Good Luck! I was able to talk them into a FREE sample. We shall see. I might have a new buisness in SUPER TV MATCHING TRANSFORMERS! I found an EPIC thread almost 50 pages long on a Canadian "Digital Forum". It takes time to go through it, but it's worth it if you want to know everything about TV antenna matching. - Experimentation with Coaxial Baluns... which work well out performing commercial baluns. However many of them are in rural areas with few stations, mostly in VHF and can and need to target. My stations are spread out. However the theoretical loss at optimal is basically zero and only tapers off on each side. Even worst case it may still beat a factor balun. If you design it for say 585 Mhz it's loss at 475 and 700 Mhz is still very low, less than -1 dB. How will it do for High VHF? We will see. I have some RG58 to play with or sacrifice a short RG59 cable. 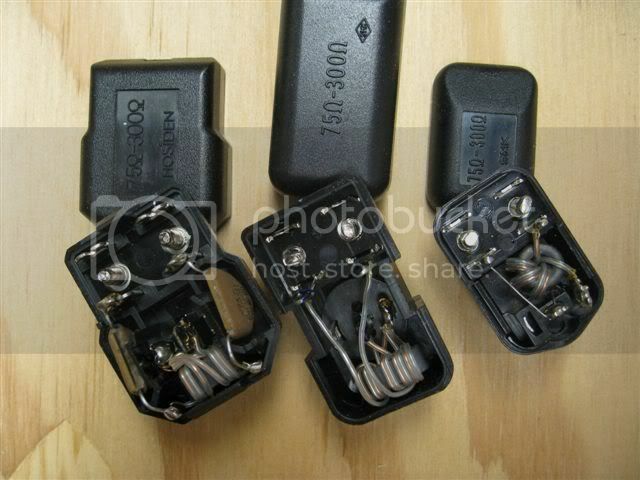 - Confirmation that baluns of same part number can vary (QC, old USA vs new China). So even if some test a balun either with some A/B comparison with their TV or some fancy spectrum analyzer there is no telling what you will buy from year to year in the same package. - Some factory baluns that come with antenna may not be 4:1, aka tuned for that antenna. Many are on PCB boards, air cores. Why they do this? Cost? Better performance? The previous comments about what kind of impedance an antenna has are right, it's not exactly 300 ohms. 4:1 may not be ideal, may be 2.5:1 might be a better ratio for a particular antenna. However impedance changes with Freqs so at some point you have to compromise. It just depends on how you optimize your antenna. Knowing your area and what Freqs are most important you can tune it. If you live in a RURAL area and only have a few stations to target there is no need to go for a general coverage antenna. The evaluation pieces are coming from two manufactures. The mini circuit TCM4-19 looks like it has excellent specs. PS I tested the two like BALUNS. They look identical but performed slightly different. The one with the tighter winding (pictured on the left below), gave consistently higher signal strength, not a lot but noticeable. I also tried the one with the capacitors again. It is clearly tuned for the VHF channels, and gave better performance on High VHF channels and worse UHF than these two below. Since I don't have LOW VHF (below the FM radio band) I could not test that. I had some RG58 and tried my hand at a coaxial balun. The feed line is a short stub of RG58 spliced into about 12' RG6 feed line right into the TV. Although the balun is 50 ohm coaxial, I suspect it is the velocity factor counts, but RG6 should be better. I compared my DIY coax balun to one of the basic push on baluns with ferrite core above. The tuned length was a little over 7", so it was tuned to about 540 Mhz. That might explain the peak in the plot below. The difference was small between the two. This is jury rig deal but works. The connector is for RG6 but made it work for RG58. This is with TV stations so signal strength varies from channel to channel. This is only relative. So it does not mean the coaxial blaun is good or bad, only relative to the over the counter cheap balun. Before I started to pat my self on the back, I connected the dipole straight, no balun. I just connected the 300 ohm twin lead to the coaxial with clips. The dipole antenna is the same rabbit ears on a mic stand I used before, horizontal, 3' each, about 78 Mhz resonant. The difference between baluns (coax or transformer) and no balun was nil. It was not more but about the same. I moved the antenna between test of the baluns, so it was not a perfect comparison. [/b] I suspect that when you connect a balanced antenna to unbalanced coaxial, it works as a mono pole, ground is just open. In other words if I disconnected the wire to the coaxial shield nothing would happen. However the signal was very good. So go figure. The only way to do test is on the actual antenna you plan on using, as was suggested earlier. Question if rabbit ears are way less than 300 ohms, why do they have 300 ohm twin lead and 75/300 ohm baluns? The antenna I made should be closer to 300 ohms but may be as low as 150 ohms, BUT AGAIN as Jack would remind us, impedance is not fixed and varies. So an antenna and balun will work best only at one Freq, but we can tune these for best advantage. The only way to do that is make your own. However desirable baluns are limited to ratios of 1:1, 1:2, 1:4 and so on. Even though the results were mixed, clearly a balun if designed well can help. To be clear no balun was not better, just not as bad as I thought it would be, however this is the the antenna I am using. BALUNS ARE NEEDED AND HELP AS THE LINK TO THE LONG THREAD ABOVE SHOWED, BY TESTS INDIVIDUALS (both casual tests using TV signals and with spectrum analyzers). Now the question is does a few dB's make a difference? If you have OTA digital TV with marginal signals at best conditions, time of day, season, can make you lose signals, so ever little bit helps to keep channels from dropping out. Amplifiers will not help, balun loses are all lost signal, not to be gained. Any thing you can do to minimize this is worth it, I think. Last edited by gmcjetpilot on Aug Wed 17, 2011 10:47 pm, edited 1 time in total. This link explains the difference between the different baluns I have. Most 300Ω ferrite baluns use two transmission-line transformers interconnected as shown. These baluns produce equal voltages of opposite phase at the 300Ω terminals when driven at the 75Ω terminals. Conversely, voltages common to the 300Ω terminals cancel at the 75Ω terminals. With both ports shorted the common-mode impedance typically is less than 20Ω. Inside a typical balun you'll find a two-hole ferrite core that accomodates both transformers without adverse coupling. Some baluns unground the transformer interconnecting lead. These baluns tend to equalize currents rather than voltages at the 300Ω terminals. This promotes signal cancellation when the parallel-line surge impedances differ, as when one line is closer to a conductor than the other. The common-mode impedance typically is 250Ω. A wire at the center of the core and two leads instead of four to the coax shield identify this as a current balun. Some voltage baluns use a single toroidal transformer as a phase inverter. What look like series capacitors actually are integrated RC networks. (That is what I have; they do look a little different than plain old ceramic capacitors but they are cap/resistor combos.) Not all single-transformer baluns have these networks, and they can be found in other kinds of baluns as well. The capacitance improves common-mode rejection below the passband while the resistance drains any static antenna charge. The first kind is a current balun, in this case a 4:1 Current-Type (Guanella) Balun. I just got the the transformer from Mini Circuits and they were NOT KIDDING! It is mini! This has excellent specs, 4:1 current type (Guanella), with insertion loss at 100 Mhz of 0.99 dB and at 700 Mhz 1.23 dB.... There are RF transformers with less loss at lower Freqs, say more like 0.50 dB but they start to fall off fast above 400 Mhz.... The old baluns were fine for TV in the USA before the digital switch when most stations of importance were on VHF. Now most stations are on UHF. In fact of the 17 networks I get only one is on VHF Hi. Also I read that VHF Lo has 40 stations TOTAL in the whole USA. So clearly the emphasis is on the higher band. Does any one have a theory why the smaller RF transformer may be better? Is it less stray capacitance? The coaxial Balun was also tried with the other TV baluns my DIY antenna. The coaxial Balun was not bad, did Ok, but again over all the other baluns were better. The other balun with tiny wires (the better one of the two) was close to the big balun/wire version, but just a tad less overall..... If I get a chance to put the info in a spread sheet I will. length of win lead would aid in matching and less loss? on ferrite's or low loss 1:1 balun for common mode noise suppression? coaxial. Of course there is the issue of balanced and unbalanced currents. First I bought a real 15 dB "drop amp" a PCT MA2-1P (or PCT MA2-M). It increased my signal strength about 4.5% and SNR about 2-3. Keep in mind these only over come the loss in distribution, coaxial and splitters. I am running about 30' of RG59 plus one splitter. I need to get some good RG6 and the final run will be about 60'. There are similar ones from Channel Master CM3410, Motorola 484095-001-00, Winegard (HDA-100 or -200 for 24 dB adjustable gain). They are all good and very low noise; you are better off with this than some cheap one at WalMart or Radio Shack (that cost more). They go for just under $30 to almost $40. The Motorola list for more but they are discounted. I got mine used on eBay for $10+$6=$16 to the door. Second I bought two BALUNS from Radio Shack and Ace Hardware.... They were best (by a tiny margin)! They both look the same, large barrel ferrite with small dual holes... It was a tad better than the larger ferrite balun that was best but very close, almost identical. Between the two barrel baluns bought at RS and Ace, one was a tad tiny bit better. The one with wires wrapped side by side with no cross over and tighter overall, was the better one (again too close to really care). The one in the picture is the one of the two I did NOT pick with the not so pretty windings. You can see that one wire cross over in the winding. This is the same thing I found with the two binocular baluns, the better looking wraps was on the better balun. Experiment complete. The signals are all good day nice... pretty much in the +90 in singal strength and +24 dB day time on all channels. Edit: part numbers of the two baluns, radio shack 15-1253 and ace hardware 30771. It is hard to say what they put in those boxes from one month to the next. I'm going to use the radio shack one. The lesson here is that not all baluns are the same. I might go exchange the one I have, for one with the short twin leads at one end to lugs and a F male female connector at the other end, just for grins. If this has the same kind of transformer it should perform as well, my be better due to better connection of a female F connector to coaxial. With the push on I have to ether use a female F connector fitting inserted or use the short 300 ohm twin lead I am using now so the push on balun can go directly on the amp. It may be better?